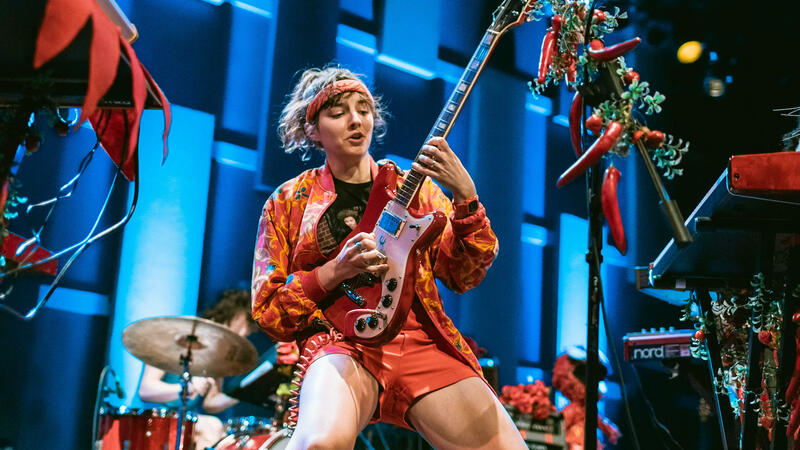 Caroline Rose performs live at WXPN's Free At Noon Concert at World Cafe Live in Philadelphia. Caroline Rose has arrived. I know this sounds a little unusual to say considering her new record LONER is her third studio album. But for a point of reference, if you listen to a moment of "Red Bikini Waltz" from her 2014 album, I Will Not Be Afraid, to her new album, LONER ... Yeah, it's a little different. But this is who Rose is. Under a guise of pop, synths and surf, a mix-up she likes to call "schizo drift," Rose tackles all sorts of issues — from being a single mother to fighting the patriarchy. Now, you might not know if you got lost in the sense of humor. For instance the cover of LONER features her in signature red Adidas track suit, post-workout, with dozens of cigarettes in her mouth, ready to light up. Spoiler alert: She doesn't smoke. This is part of Rose's charm, as you'll hear in our conversation in the player, which starts with a live performance of "Soul No. 5."